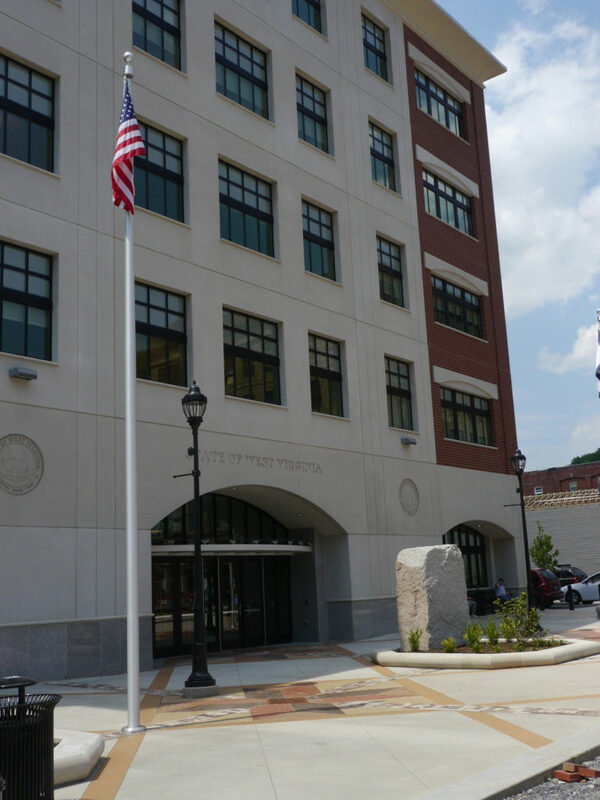 March 2014, (Logan, West Virginia) – McKinley & Associates is pleased to announce Building 55: West Virginia State Office Complex in Logan has been awarded LEED® Certification established by the U.S. Green Building Council and verified by the Green Building Certification Institute (GBCI). LEED is the nation’s preeminent program for the design, construction and operation of high performance green buildings. This new five story building underscores its major role in the development and revitalization of downtown Logan by uniting office space for various state agencies under one roof, whom were once scattered throughout the city. The 53,200 SF building provides current technology, flexibility for future growth, and security features for existing and future tenants. The building was designed to be energy efficient and meet sustainable design goals. One of the unique features of the building is the daylight system. The design takes clues from older buildings that were designed to let daylight penetrate deep into the buildings by necessity. To enhance this effect we added “light louvers” which are devices that redirect daylight to the ceiling and diffuse natural light throughout the space. The open offices were placed around the exterior of the building and the enclosed offices along the interior wall so more of the tenants receive quality light. In addition, interior windows allow the daylight to pass to the center offices. Building 55 achieved LEED certification for energy use, lighting, water and material use as well as incorporating a variety of other sustainable strategies. By using less energy and water, LEED certified building save money for families, businesses and taxpayers; reduce greenhouse gas emissions; and contribute to a healthier environment for residents, workers and the larger community. By incorporating history, technology, security and structure; this building has successfully created the desired catalyst for the future of Logan.